Deep Purple in Montreal or Quebec City? Inform me about the next events for Deep Purple. Enroll yourself to our priority waiting list for Deep Purple to be alerted when new tickets are available. Filling this form doesn't engage you to any purchase. Deep Purple is coming to the Bell Centre on August 29th, 2018, and at the Videotron Centre, in Quebec city, on August 30th, 2018, alongside Judas Priest ! Deep Purple last performed in Montreal & Quebec in 2011. The current make-up for Deep Purple consists of Ian Gillan (vocals), Don Airey (Keyboard), Steve Morse (guitar), Roger Glover (bass) and Ian Paice (drums). The band sold over 130 millions albums during their career ! 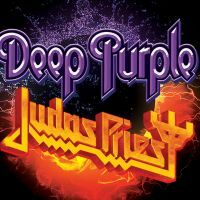 Don't miss the return of Deep Purple, along with Judas Priest in Montreal and Quebec City this summer !